Edge Pro system - Pro or Apex? Discussion in 'Cooking Knife Reviews' started by jwk1, Jan 18, 2010. In going over the Edge Pro site, I see two problems for me. One is that I can't figure out what huge difference there is between the pro and apex. The difference in price is huge, so I'm sure there is a reason. I just don't know what it is. I'm the kind of person who enjoys things that are "over engineered", as one of my friends would say. I also can "over buy" at times, so I would like to avoid that when it involves hundreds of dollars. All of the reviews online from what I've been able to find are about the apex. Just wondering if anyone here has any knowledge/experience with the pro. I'll call Edge Pro sometime this week, just would like to get as much feedback from users as possible. I don't mind spending extra money if there's something to it, especially if it's something I'll probably use for the rest of my life. Ten years from now I won't care about the extra money I spent if I'm still using it. The other problem I see is that there really doesn't seem to be a practical "kit" to buy, especially with the apex. I mean, who wants one of those eight inch honing sticks? I have a 10" right now I use and would like to get a 12" for truing the 10" chef and slicer. I also read somewhere that the grit numbers don't correspond to typical stones. Anyone know anything about that? I still wonder sometimes if I'm making this more complicated than necessary. I think I should just get a decent set of stones and start learning. Then I think about the last time I tried to freehand my 10" chef and finally got the Lansky out... Enough said. Can anyone tell me about the Edge Pro "Pro"? Edit to add: Come to think of it, maybe you don't want the ceramic hone at all if you're polishing the edge of your brand new Masamoto HC? Wouldn't the ceramic hone ruin a very sharp, polished edge? Really good questions coming out of what seems to be a lot of general knowledge about and an appreciation for tools, and plenty self-knowledge as well. Short answer is Apex. You don't need the Pro unless you plan on becoming a professional sharpener. Call Ben Dale (the Edge Pro guy) and talk to him; or at least email your questions. The Edge Pro grits aren't idiosyncratic or unique, they're just listed in ANSI (American), and not JIS (JIS) -- which is becoming the dominant standard in deluxe sharpening because of the superiority of Japanese waterstones over... well... darn near everything. It sounds like you want some sort of custom set -- not the 2, 3, or 4, but a mix-and-match. Do they do that? Native pessimism suggests probably not, but I don't know. Another question for Ben. It may be cheaper to get a kit that comes with the 8" hone and just not use it. A couple of guys (at least) are cutting down really high quality "regular" water stones, like Naniwa Chosera and Shapton Pro, so they fit in the EP's stone holder. People I know who've added them to their set are ecstatic. Something to think about for sure. Chef's Knives To Go has them listed on their site; but are out of stock on the most desirable and have been for a couple of months at least. Call CK2Go and talk to Mark about that, and your other EP questions too. I've been freehanding for more than forty years. Starting from scratch, results oriented, and knowing what I know, I'd go Edge Pro. It's a little fussy, and not quite as versatile; but the learning curve is so much flatter and results so certain. Plus, when you compare an EP to high quality stones, they're roughly, equally, ridiculously expensive. If you want a good 12" "steel," it's tough to beat the Idahone fine ceramic at under $30. I'm hearing a lot of good things about the DMT Ceramic (CS2) as well which is only a couple of bucks more than the Idahone, and supposedly unbreakable. It's also supposedly a bit finer, but -- gossip, not experience -- may come a little bit rough from the factory and take some breaking in with emery cloth. If you're super-serious and ready for XTreme!! Steeling!! !, click over to HandAmerican borosilicate & Idahone honing rods and drool over the HandAmerican two hone (12" HA borosilicate + 12" Idahone fine ceramic + some other very useful junk) kit ($95). The HA borosilicate ($75 by itself) may well be the finest steel on earth used on a sharp, polished edge, but is not a stand-alone. Hi. I was in a similar situation as you, I ended up getting the EdgePro Apex system 3, from Chef Knives to Go. After living with my Apex for a month or so, I really don't feel a need to have anything different (ie, the Pro model). How many knives do you plan on sharpening a week? If it's just normally use I know I'd be happy with the Apex. If you like you can ask further questions in the Keeping Sharp Forum, at the Knife Forums. My Apex3 came with the small ceramic hone. I was thinking of just leaving it at work since I've got my IdaHone at home. But then I got to thinking about how many knives I'm sharpening for other people. If I go over someones house I'm asked to bring my sharpening kit. The little 8" hone works perfectly for this. Oh...and you will be sharpening knives for other people, I guarantee it! There are stones other than the EdgePro stones out there. I talked to Ben Dale and he said that he tried some of the other stones but prefer his. yet others say the results are simply wonderful. When I ordered my kit most all of the Shapton and Chosera stones were out of stock. So I ordered the Apex3 which comes with a nice array of EdgePro stones, but no polishing tapes. This morning I happened to check Chef Knives to Go at the right time. They finally had the Shapton and Chosera stones in stock! (yes, I was checking daily) I filled my cart with the wanted stones and clicked to pay with PayPal. I then found out that Paypal had an unsolicited hit on my account so they suspended my account until I contacted them. I went back to just pay with a credit card and many of the stones were now sold out! I ended up getting a mixed bag of stones, but not exactly what I wanted. Even so...the Shapton and Chosera stones will be for my knives! Nothing against anyone else...but I'll use the cheaper EdgePro stones when I'm sharpening someones knife. Jende Industries has a comarison chart for various grits supplied above. I haven't used the Pro so I can only go on what I've been told by guys who have used it. The Pro is a little more robust (although both carry lifetime warranties) and the Pro is required to use the scissors attachment. The main virtues of the Pro are that it will accommodate lower sharpening angles (without resorting to jury rigging), it will sharpen scissors and it's adjustable for work height. The stone arm of the Pro allows you to use the full stone end-to-end a bit more effectively than the Apex as well. The advantages of the Apex are price & portability- it costs 1/2 as much and is so compact that once folded you can fit it in your knife roll. Operationally, with the Apex the "mast" is fixed and the arm moves up and down on it; on the Pro, the arm is fixed to the "mast" and the whole thing moves up and down. Both achieve the same net result. The Pro has a powerful suction base that really clamps down well while the Apex has 2 legs and 2 suction cups. In practice the Apex can be rock solid because of the 4 points of contact but the smallish suction cups can skid around a bit, depending what you mount them on. Ben Dale has stated both will do an equal job, so if you need to sharpen scissors or appreciate that "over engineering" get the Pro. But if you just want to do knives you'll want for nothing if you opt for the Apex. The only place to get the Pro is direct from Ben @ EP. The Apex is available at many resellers. If you choose to buy the latter I confirm that CKtGo is a great vendor. 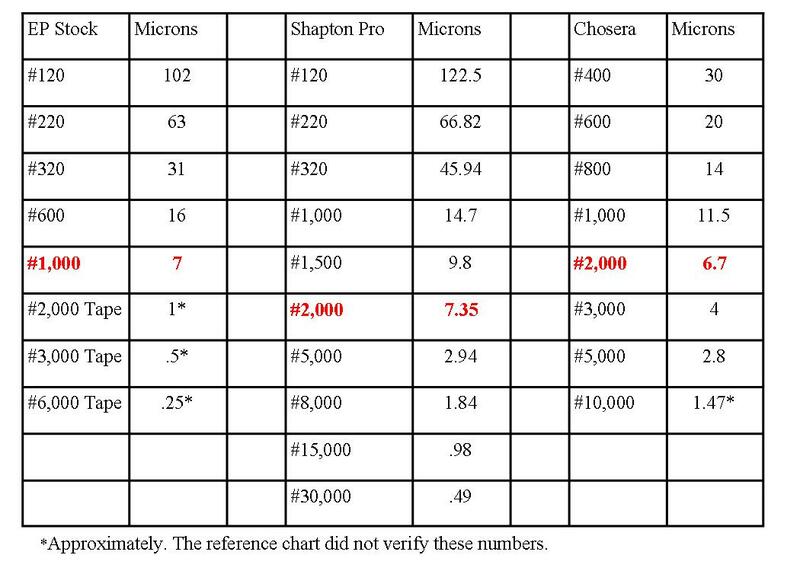 I suspect that as the Shapton & Chocera supply rebounds from the initial heavy demand Mark may once again sell an EP Apex kit with all-Shapton stones as he once did. The Choceras & Shaptons do offer a significant upgrade from the stock stones, as well as many more grit options, especially at the finer grits. But don't for a moment think that means the OEM stones aren't worthwhile- they're terrific. Think of the aftermarket stones as lagniappes, not the raison d'être for EP. With just the OEM stones and tapes on a glass blanks you will discover an entirely new level of sharp you never knew existed. I personally love the 8" hone that comes with the EP, and I see no need to use a larger one, but if you really prefer it you can get a longer one, from Ben or several other vendors. The DMT CS2 is a great one, and you can get an Idahone in a 12" wooden handled version, too. Eventually you may want to try the HA Glass hone, probably the best hone out there IMOHO. With the caveat that I haven't used the Pro, I'd suggest the Apex will probably suffice. If you go that route you have two viable choices- get the top level kit or go for the cheapest one & buy extra stones to go with. While you're learning to use it you may be better off using the cheaper supplied stones, but it won't take you long to get the hang of it. Once you're confident on the machine you may want to explore the options, both aftermarket stones and different polishing media (eg EP tapes, 3M PSA, Nexcare tape with diamond spray abrasive, etc). BDL, gonefishin and Phaedrus - Thanks all so much for the great information! Each post was EXTREMELY helpful. So many levels of ability and quality, so many choices, so much to spend. This is as bad as being a musician! I'll let you all know what I get when I get it......and then I order my japanese knives!